Prepare yourselves for a simple, delicious, & healthy dinner. We’re making homemade chicken burgers with eggplant, roasted red pepper, mushrooms, onions, and, the most important part, the fried egg on top. See that? OH yes, it’s delicious. 1) Preheat your oven to 375 degrees F. Line a large baking sheet with foil, and then spray with cooking spray. 2) Chicken burgers: Put the chicken breasts in a food processor and process on high until ground. Put the meat in a large bowl with 1 egg, sun-dried tomatoes, liberal dashes of Italian seasoning, and garlic. Stir together and then shape into 4 patties. 3) Arrange the patties on the baking sheet and bake in the oven for about 15 minutes. When you cut one in half and there’s no pink left, they’re done. 4) While the chicken is cooking prep your veggies. 5) For the eggplant, slice off the top and bottom and discard. Then, cut into about 1/2 inch thick slices. Arrange in a single layer on a baking sheet and sprinkle with salt. When the chicken is done, place the eggplant on the baking sheet and bake it for about 15 minutes. It’s done when the tops/bottoms start to get golden. 6) For the red peppers, cut the stems out. Then, cut them in half. Clean out the seeds. Sprinkle with salt. Bake the halves in the oven about 20 minutes. 7) For the onion, slice it in half, and then cut into onion strips (halve circles). Bake the onion for about 20 minutes in the oven. 8) Spread the mushrooms out on a baking sheet, and bake until most of the liquid is evaporated. 9) Once everything is cooked, you’re ready to assemble. 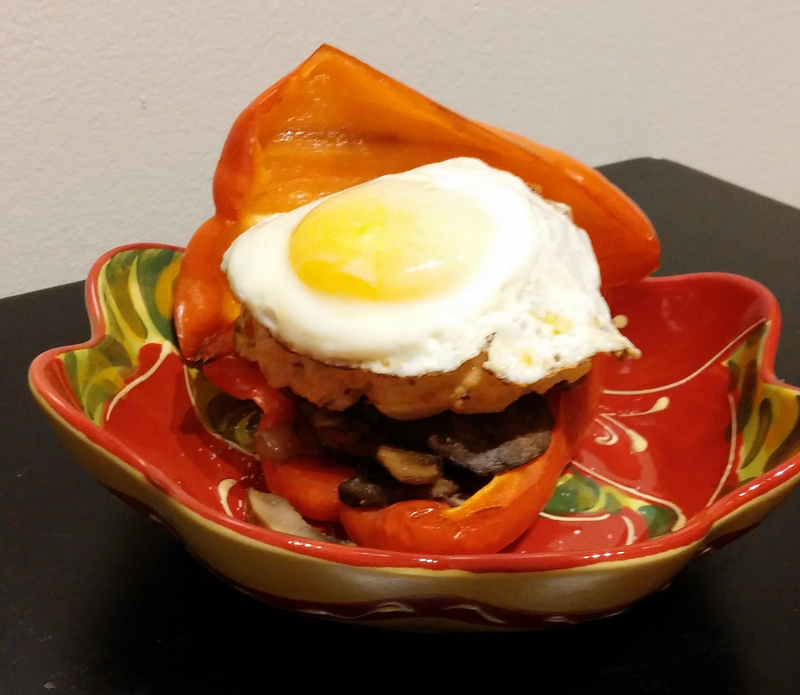 10) On each plate, layer half a red pepper– face up. Fill that with mushrooms and onions. Then place the eggplant slice, then the chili garic sauce, and then the chicken burger. Put some more onions and mushrooms on top of the burger. 11) Make the fried eggs: Spray a large non-stick skillet with olive oil cooking spray. Then heat the pan over medium heat. Crack in the eggs. Then, place a lid over the pan. Let ’em cook! When the whites turn, well, white, and the yolk is still soft but looks like it’s just starting to cook, they’re done. Place one egg on top of each chicken burger. Oh and did I mention it’s also paleo and gluten free?